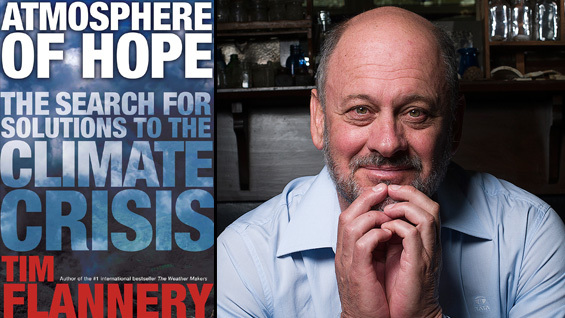 Tim Flannery on "An Atmosphere of Hope"
Tim Flannery, the author of the international bestseller The Weather Makers, will give a free public talk based on his new book Atmosphere of Hope: Searching for Solutions to the Climate Crisis (Atlantic Monthly Press). The discussion around climate change today is characterized by either overwhelming pessimism or paralyzing indifference. In Atmosphere of Hope Flannery puts forward an engaging and practical alternative plan to deal with the climate crisis, with achievable goals grounded in reasonable optimism that can lead us toward an ecologically viable future. Drawing on the latest science, Flannery gives a snapshot of the trouble we are in and more crucially, proposes a new way forward, including rapidly progressing clean technologies and a “third way” of soft geo-engineering. Tim Flannery is an internationally acclaimed scientist, explorer, and conservationist. He has published more than 130 scientific papers and several books, including The Weather Makers, Throwim Way Leg, Here on Earth, and Among the Islands. He was named Australian of the Year in 2007, and from 2011 to 2013, he was head of the Australian Climate Change Commission.